Perdoor (Udupi District): Paddy farmers in Udupi district feel that they have been left in the lurch due to the increasing production cost, labour problem and lack of good price for the produce. The problems faced by farmers can be gauged by the decline in the area under paddy cultivation in the district. 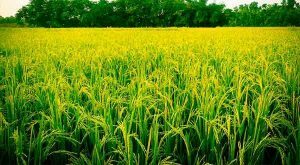 The net area under paddy cultivation in the district, which was 54,000 hectares in 1999-2000, came down to 51,600 hectares in 2006-07. This despite the fact that paddy is the chief kharif crop in the district. Rajeev Shetty, a farmer from Perdoor village in Udupi district, who has 7.28 acres of land, has been growing paddy for the last 30 years. Nearly 20 years ago, he grew paddy in four acres of land. Another farmer, B.V. Poojary, was cultivating paddy in 12 acres of land 10 years ago, now it has come down to two acres. Bhaskar Shetty, a farmer from Uchila, was cultivating paddy in seven acres of land 10 years ago, which has come down to two acres now. Bhaskar Shetty said that he was getting workers from places such as Shimoga, Sorab and Haveri for planting and cutting purposes. The (men) workers from other places, who were charging Rs. 100 to Rs. 120 a day, were now charging Rs. 150 a day to Rs. 180. This increase in labour charges has hit paddy farmers. Increasing cultivation cost has affected the farmers. Fragmented land holdings have only added to this problem. According to Bhaskar Shetty, if paddy cultivation has to be profitable, the cultivation cost should not go beyond Rs. 10,000 an acre of land. Rajeev Shetty said that he had to spend Rs. 8,000 for cultivation, which included labour charges, cleaning and other charges. He produces about 14 quintals of paddy in one acre of land. “My cultivation cost is low because my wife Revathi and I are involved in agriculture,” he said. Poojary said that his cultivation cost went up to Rs. 10,000 an acre of land. While big farmers use tractors and mechanised tillers for ploughing, small farmers still depend on cattle. Bhaskar Shetty grows 25 quintals to 30 quintals of paddy an acre of land. He follows organic farming and uses tractor for ploughing. Below-normal rainfall in June and in the first week of July has affected cultivation of paddy, the chief crop, in Udupi district even as farmers keep hoping that the monsoon will pick up in the coming weeks. According to the figures provided by the Department of Agriculture here, the area where sowing of paddy has taken place in the district is just 17,390 hectares against a target of 45,000 hectares (ha). The 17,390 ha in the district is spread over 5,440 ha in Udupi taluk, 8,050 ha in Kundapur taluk and 3,900 ha in Karkala taluk. Normally, by this period, sowing should have been completed in 24,000 ha in the district. Satish, Technical Officer in the Department of Agriculture, said that there had been a shift in rainfall pattern since 2010. “Hence, farmers, who were earlier doing sowing/planting of paddy in the first and second weeks of June, are now doing it in the third and fourth weeks,” he said. Rainfall is deficient by 26.35 per cent in the district since January. This year, the district received 1,117 mm of rainfall from January 1 to July 4, whereas, normally, it should have received 1,517 mm rainfall during the period. But the dip in rainfall in the first week of July has been quite sharp. Normally, the district gets 371 mm of rainfall from July 1 to 7. But this year, it has got just 93.6 mm, while last year, the rainfall received was 126.7 mm. According to Bantakal Ramakrishna Sharma, president of the Zilla Krishik Sangha, the deficient rainfall made it difficult for farmers to take up sowing operations for paddy, especially in the uplands of the district. “Rainwater should remain stagnant in the fields as this helps in paddy cultivation. So far, it is only farmers in the lowlands who have taken up sowing operations,” he said. “Rainfall was deficient in June; it has been lesser still in the first week of July. We are praying that there will be rain in the weeks to follow,” he added. “Farmers can grow short-duration paddy varieties and make up for the loss of time in the coming weeks,” said Anthony Maria Immanuel, Joint Director of Agriculture. B.V. Poojary, a farmer from Perdoor village, said that the deficient rainfall in the district would not affect farmers much. “Most of the farmers follow a mixed crop pattern. They grow arecanut, coconut, black pepper and other crops and are not dependent on paddy alone,” he said. Meanwhile, the Department of Agriculture took up the System of Rice Intensification (SRI) in 250 hectares in the district in 2006-07. The department claims that farmers following SRI have registered about 20 per cent increase in production. The department intends to increase area under SRI to 6,000 hectares in 2007-08. So the next big question arises : What is SRI? 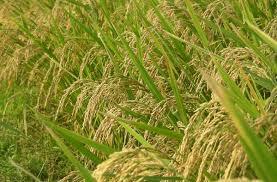 The System of Rice Intensification (SRI) is a methodology aimed at increasing the yield of rice produced in farming. It is a low water, labor-intensive, method that uses younger seedlings singly spaced and typically hand weeded with special tools. It was developed in 1983 by the French Jesuit Father Henri de Laulanié in Madagascar. Rice field soils should be kept moist rather than continuously saturated, minimizing anaerobic conditions, as this improves root growth and supports the growth and diversity of aerobic soil organisms. Rice plants should be planted singly and spaced optimally widely to permit more growth of roots and canopy and to keep all leaves photosynthetically active. Rice seedlings should be transplanted when young, less than 15 days old with just two leaves, quickly, shallow and carefully, to avoid trauma to roots and to minimize transplant shock. Proponents of SRI claim its use increases yield, saves water, reduces production costs, and increases income and that benefits have been achieved in 40 countries. Uphoff published an article in the International Journal of Agricultural Sustainability that states that SRI “can raise irrigated rice yields to about double the present world average without relying on external inputs, also offering environmental and equity benefits”. A special issue on SRI in the non-SCI scientific journal Paddy and Water Environment collected recent findings in support of SRI. In 2011 five farmers reported that they had beaten the old yield record, the best was a young farmer named Sumant Kumar, who reported setting a new world record in rice production of 22.4 tons per hectare using SRI, beating the existing world record held by the Chinese scientist Yuan Longping by 3 tons. In 2014 S Sethumadhavan from Alanganallur, India reported a record yield of nearly 24 tonnes of paddy rice per hectare using SRI. These reported records were not obtained under audited supervision nor under standard methods for measuring yields. They were not subjected to peer review, being reported only in the popular press, and are suspected to be physically impossible in the localities where they were obtained.